Microsoft told us that its goal for the Surface 3 tablet is to “get the Surface into more folks’ hands”. It reckons it can do this by offering a more affordable product that’s still similar in form and function to the Surface Pro 3. How has it achieved this? It has reduced the size of the tablet to 10.8 inches and dropped the latest Intel Atom CPU into its belly. Some of you may cringe at the mere talk of Atom, but you shouldn’t. Over the last year or so (starting with the Bay Trail-codenamed products), the Atom range has shown that it can allow a Windows tablet to perform reasonably well when it comes to common, ‘everyday’ tasks. The Intel Atom in the Surface 3 is an x7-Z8700 model, that’s part of the latest generation of Atom CPUs that are codenamed Cherry Trail. It’s this CPU that puts the Surface 3 in a class below the Core i3-based Surface Pro 3 tablet, and it’s what makes it a reasonably affordable entry level product for users who don’t require the gutsier CPU in the Pro models. With the Atom x7 in the Surface 3, we did notice some sluggishness, but only when running multiple tasks that required CPU time simultaneously. For the most part, it was a responsive tablet that was a joy to use. The Cherry Trail Atom in our test model was joined by 4GB of RAM and a 128GB solid state drive (SSD), and for this configuration the cost is $839. There is a lesser configuration of 2GB of RAM and a 64GB SSD that costs $699, a configuration that will be more popular with wallet watchers. The thing is, the $839 price tag isn’t too far off the price of an Intel Core i3-based Surface Pro 3 with a 64GB SSD (about $135 at the writing of this review), so some of you might give in and go for the extra processing speed. A smaller, more portable size may be the thing that makes the Surface 3 more attractive than the Pro, though. 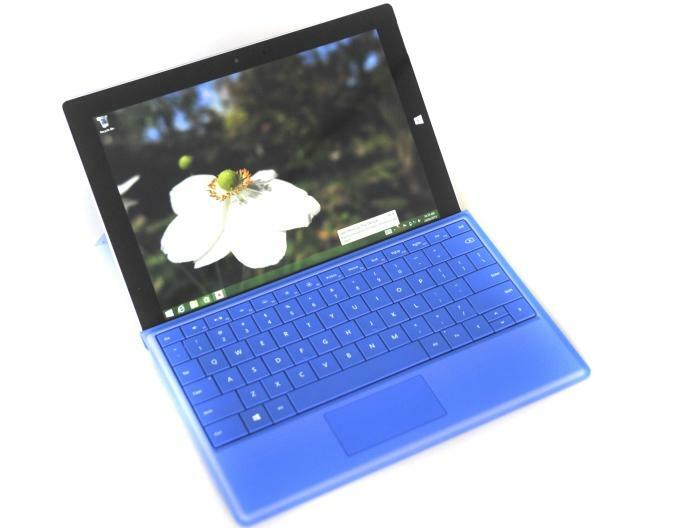 On its own, the 10.8-inch Surface 3 weighs 617g compared to 795g for the 12-inch Surface Pro 3. Add the Type Cover accessory, and the Surface 3 comes in at a healthy 886g, while the Surface Pro 3 crosses the 1kg mark and almost hits 1.1kg. It all depends on what you want to achieve with the device. If you want something that’s more conducive to content creation (building presentations, doing spreadsheets, and editing photos), then you will more than likely want the bigger Pro version with the faster CPU. If all you want is a tablet for perusing Web pages, streaming videos and music, and viewing photos and communicating online, the smaller Surface 3 and its Atom will suffice. Spending a week with the Surface 3, we got to know what it can and can’t do early on. For the most part, it’s not great at multitasking, especially if those tasks need to consume a lot of CPU time. Things such as Web pages with lots of Flash elements can bog down the tablet and cause it to respond slower than it otherwise would. We found it to be fine for tasks such as viewing Netflix and other streaming video on demand services, and we could do things such as stream music from Google Play Music and send it over to a stereo via Bluetooth while we still browsed the Web and typed up this review in Google Docs. (At this point, we’ll note that an Office 365 subscription for this device is offered by default.) When we used the tablet in this way, we did notice that scrolling in Web pages was slower, and typing in Docs also suffered a minute delay between our typing and the resulting display. Running our Blender 3D rendering test for some perspective, the Surface 3’s 1.6GHz Intel Atom x7-Z8700 processor recorded a time of 1min 25sec. This is 25sec slower than a tablet running Intel’s 1.2GHz Core M CPU (codenamed Broadwell Y), and about 10sec faster than a tablet running Intel’s 1.59GHz Atom Z3795 (codenamed Bay Trail). Testing out the storage with CrystalDiskMark, the 128GB SSD recorded a sequential read rate of 106.7 megabytes per second (MBps), and a sequential write rate of 30.77MBps. These rates are not unheard of for a tablet in this class, but the write rate is 5-10MBps slower than we expected. In our battery life test, in which we disable power management, maximise screen brightness, enable Wi-Fi, and loop a Full HD, MP4 file, the Surface 3 lasted 5hr 58min. Battery life can be prolonged depending on the tasks you run (if they are not CPU intensive) and if you use a low screen brightness where possible. Like all good Windows-based tablets, the Surface features some ports on its sides so that you can plug things in. There is a full-sized USB 3.0 port, a Mini DisplayPort, and you even get a microSD card slot, which is hidden from view under the kickstand. A change to this Surface is the addition of a micro-USB port, which is the interface through which the tablet can be charged (USB On-the-Go drives can also be plugged in and accessed). You can’t just use any charger to replenish the Surface 3’s battery (nor a mobile battery pack that can typically be used for Android tablets and iPads), as it needs the extra juice that its own charger supplies. You can use the Surface’s charger to charge other devices if need be, though the end of the cable is extra wide in order to provide a good grip for plugging and unplugging the charger from the tablet. It’s not as fiddly as the connector on the Surface Pro 3. For using the Surface 3 as a display on your desk (or while lying in bed), you can extend the built-in kickstand -- one of the features that we love about Surface tablets. 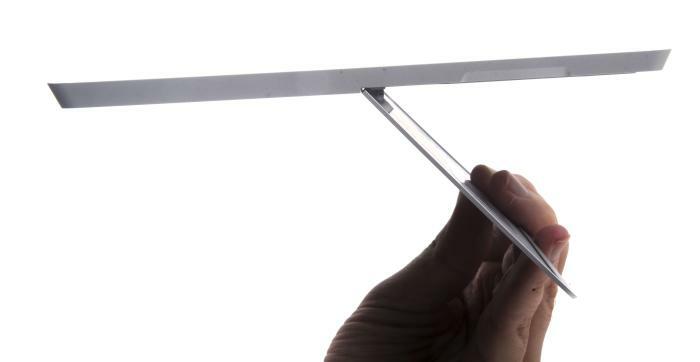 The kickstand on the Surface 3 doesn’t have a free-flowing hinge with variable angles like the Surface Pro 3, but it does feature three distinct angles that snap into place firmly. Standing upright with the Type Cover attached. Leaning back as far as it can go. The stand locks in place at three different positions. 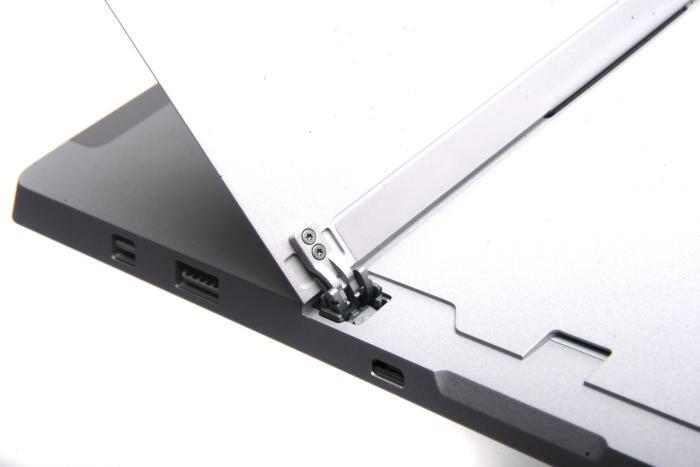 As a safeguard against the heavy handed, Microsoft has designed an ‘emergency release’ of sorts for these hinges. If you try to take the kickstand past its maximum angle, the pressure will force the hinges to ‘snap’ out of their final position. The kickstand then flaps around, so to speak, until you snap it back into its hinges. This design can help prevent the stand and hinges from breaking, though we’re not sure how many ‘accidental’ exertions of extra pressure they will handle. A close-up of the hinge. The 10.8-inch screen of the Surface 3 has a native resolution of 1920x1280 pixels, meaning you get an extra 200 lines of vertical resolution compared to a regular Full HD screen when using the tablet in landscape mode. This extra space can be noticeable in Web pages and when viewing documents and spreadsheets. However, the pixel density of the screen can make text rather hard to read a lot of the time. For this reason, Microsoft (and indeed other vendors that use screens with a high dot count) has the text and icon size set to large. This doesn’t overcome the problem completely, as Windows 8 doesn’t scale some dialogue boxes and tooltips, while some windows can end up looking muddy. Nevertheless, it’s a good screen that has wide viewing angles and a high enough brightness level to cope with the lighting in typical office and home environments. That said, you can still see reflections, but it also depends on the angle that the screen is placed. We found the screen to be of good colour and crispness, and it was especially good for the full-screen viewing of photos that were shot with a 3:2 ratio; these photos filled the screen completely. 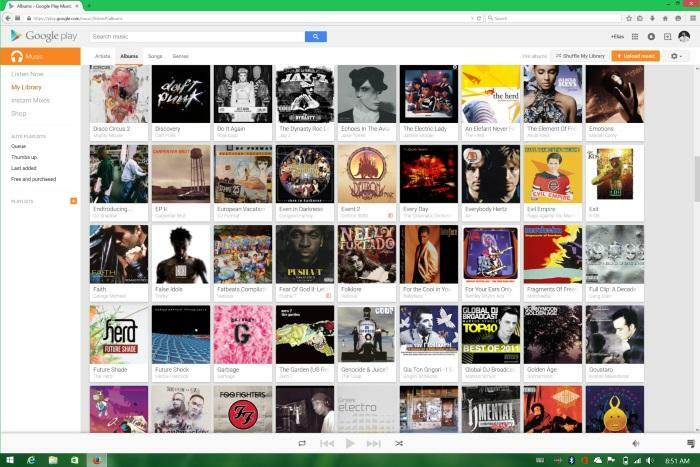 The 1920x1280 resolution allows you to see plenty of albums per screen in services such as Google Play Music. The surface of the Surface (sorry) felt smooth to the touch, and all Windows 8-centric gestures that we tried, such as the swipes in from the edges, worked smoothly. Browsing the Modern UI was also smoother than we expected, with icons flowing freely from side to side until we found what we were looking for. Other things to note about the hardware are that the Wi-Fi adapter supports 802.11ac (via a Marvell Avastar module). It connected to our TP-Link Archer C9 router at 867Mbps, and we could transfer movie files onto the Surface 3 at a rate of 30MBps. You also get front and rear cameras, with the front having 3.5 megapixels, and the rear having 8 megapixels and autofocusing capability. The speakers face forward and are installed up near the top of the screen (when in landscape orientation), with their sound escaping through gaps that have been cut in the edges of the Gorilla Glass. As far as tablets are concerned, the sound is quite decent. It’s not loud, and it’s a little tinny, but it’s clear overall, and useful if you don’t have headphones or a Bluetooth speaker to hand. An unlocked 4G/LTE version of the Surface 3 will be released at some point, too. For handwriting recognition, the Surface Pen accessory is needed, and what we noticed most about this active pen was the way it rode the glass. We found it to be smooth in its operation as we wrote words on the screen, yet with a slight hint of grip at the end of each stroke. It wasn’t as silky smooth as the writing we’ve done on higher-end products such as the Lenovo ThinkPad Yoga, but it was still something we were able to appreciate. The recognition of handwriting from within Windows was typically good, with the system guessing correctly at what we meant when we performed our messiest running writing. We could tell there was a delay as the Surface 3 studied what we wrote before attempting the recognition, but it was nevertheless quicker than we thought it would be for an Atom-based computer. We like the Pen accessory a lot for writing, but wish it was standard. Like the Type Cover, you have to pay extra ($60), and you can select the colour that you desire (if you desire blue, red, black, or silver). It has a good weight to it (thanks to the batteries mostly), sits well balanced in the hand, and supports 256 levels of pressure. There is nowhere to place the pen on the tablet, but if you have purchased the Type Cover, then you can clip it on the cover as if it were a real notepad. The Type Cover is the other accessory that really is a must if you have any inkling to type on the Surface 3, be it for your email correspondence or upcoming novel. It has mechanical keys that can be backlit in five intensities, and it almost has the feel of a proper keyboard because of the way the keys travel and respond. 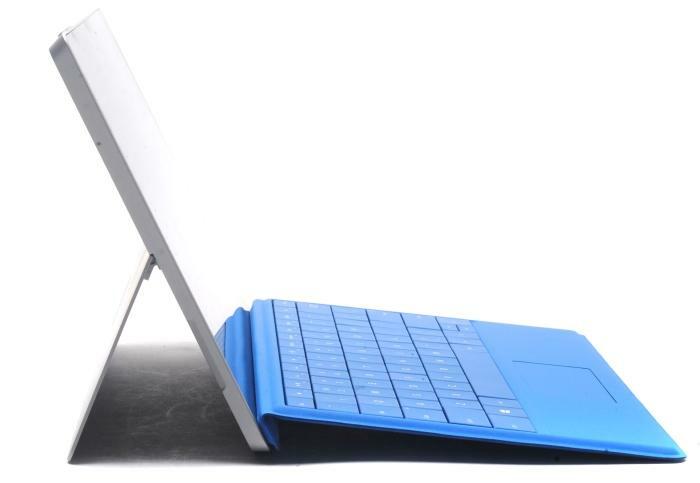 It’s similar to the Type Cover for the Surface Pro 3 -- it even has the magnet that allows the keyboard to sit at an angle -- but it’s not as long as the Pro’s cover. The kicker is that it’s a $170 keyboard, which means the price of the Surface 3 goes over $1100 if you purchase the top model with the Surface Pen and Type Cover. In a surprising twist, Microsoft also has a dock accessory for the Surface 3, which is similar to the dock for its Surface Pro 3. Instead of a docking connector, though, the docking looks to be made via the USB 3.0 and Mini DisplayPort interfaces (we haven’t personally seen this this accessory yet). This dock can supply two USB 3.0 ports, two USB 2.0 ports, Gigabit Ethernet, Mini DisplayPort, 3.5mm audio, and a security lock. This should help make the Surface 3 appeal to business users who don’t have the need for the extra CPU power in the Surface Pro 3. A couple of things stand out about this tablet for us: its high-res screen, and the built-in kickstand. These features alone make it a very good product to consider if you’re after a basic Windows tablet. Furthermore, we feel as though Intel’s Cherry Trail Atom, while not being super-fast, contributes to an overall enjoyable experience because it allows the tablet to run without making any noise, and without getting warm. We’d pick up this tablet for use as a media streaming device around the home, and for basic Web browsing and online communications. If you add the Type Cover and Surface Pen to the mix, then it’s also a good unit for productivity. In fact, you can use the Surface 3 as a laptop and for long typing sessions if you wish. It takes a bit of a balancing act to use the Surface 3 on your lap, to be sure, but we’ve seen it being done with good success. Unfortunately, the accessories are rather pricey, and will set you back quite a bit if you’re looking to go all the way and use this tablet as a hybrid laptop. Note that the Surface 3 comes with Windows 8.1, rather than Windows 8.1 Pro, and will get a free upgrade to Windows 10. It's available to pre-order now from Microsoft's site.